Rehearsals for Jacob Marley’s Christmas Carol officially began yesterday, and after months of thinking about it, preparing for it, and if I’m honest, being pretty nervous about it, we are off and running. 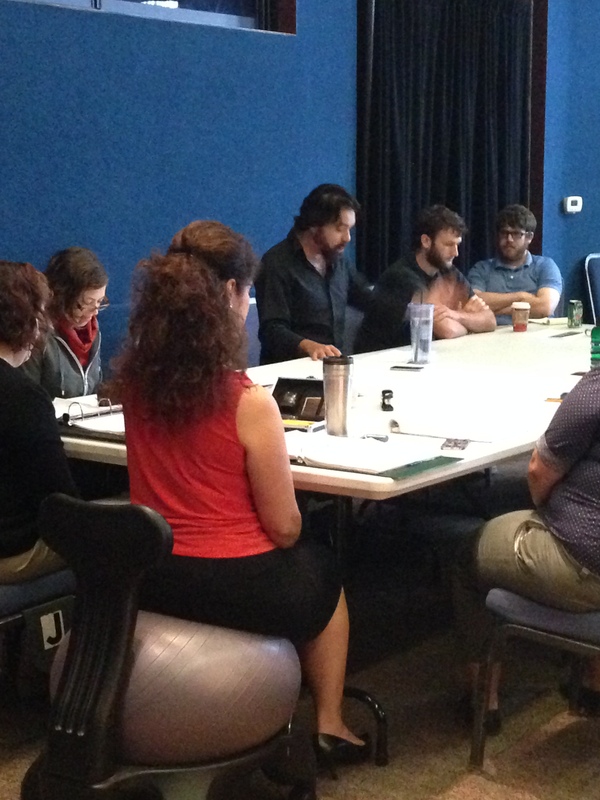 We started rehearsal yesterday the same way we begin every rehearsal process: with a table read. The cast (that would be just me) gathers around a table with the crew and staff and other invited guests and we (and when I say we, I mean me, not to put too fine a point on it) read through the play. We’ve blogged about first reads before, but this was a unique experience for me and I found myself surprised, enthralled, and moved in unexpected ways that I want to examine a little further here. When I play a normal character in a show (meaning not 18 of them), that character’s journey is partly influenced by the accumulated emotional and physical energy that I have spent during the performance. This cumulative effect really does build up and have a dramatic outcome in the final moments of my performances. As an example, I could reference my performance as Caleb in The Whipping Man last year. This character loses a leg, and all that he holds dear throughout the course of the play, and in the last moments is asked to confront an unknowable future. The physical and emotional journey that I took during that play absolutely took its toll on me as an actor, and therefore on Caleb as a character, and as the lights faded, the final tableaux was informed by all that had happened to me (the actor, not the character) before it. Now, if you can make sense of that somewhat artsy-fartsy concept, I will ask you to follow me a little further down the theatrical rabbit hole. Imagine if you will, a character that goes through a very emotionally taxing journey, like Caleb, say. And of course, the other people in the play are also going through that dramatic emotional journey. Oh, and in some plays, there is of course the comic relief, and so we have those journeys to add in as well. And some people’s stories end well, and maybe some people’s stories don’t end well. So, you’ve got all these varied story lines, physical lives, emotional lives. With me? Okay, I will assume you are. Next step, roll all those various character journeys into one. And that is what happened to me yesterday. Somewhere towards the end of the second act, as all 18 characters’ journeys were wrapping up, I found myself getting very emotionally overcome. And not always in appropriate moments. But that cumulative effect really overtook me. As the only actor, tackling all 18 roles, I was not able to separate those various journeys and compartmentalize them, so they started to bleed together and I was overwhelmed. It was a very exciting, very confusing, very charged moment. And I want to make sure that while I clarify and lose the muddiness of the overlapping journeys, that I don’t also lose the power of that accumulation. So among many other things, that is my job over the next few weeks as we start to unpack this play. I must keep those surprises, that emotional connection and the satisfaction that I felt at completing a wonderful journey. And also, I feel a lot less nervous today. We have begun, and that’s the only way to make sure that you go on a journey at all. You just gotta start.